The Toyota Prius c (c stands for "city"), named the Toyota Aqua ("aqua" is Latin for water) in Japan, is a full hybrid gasoline-electric subcompact hatchback manufactured and marketed by Toyota Motor Corporation. The Prius c is the third member of the Prius family, and combines the features of a Yaris-sized car with a hybrid powertrain. The Prius c is priced lower than the conventional Prius and has a higher fuel economy in city driving under United States Environmental Protection Agency test cycles. The Prius c was ranked by the EPA as the 2012 most fuel efficient compact car when plug-in electric vehicles are excluded. The production version of the Aqua was unveiled in the 2011 Tokyo Motor Show. The production Prius c was introduced in the U.S. at the January 2012 North American International Auto Show in Detroit. The Aqua was launched in Japan in December 2011 at a price of ¥1.69 million (US$21,700). Sales in several Asian markets began in January 2012. The Prius c was released in the U.S. and Canada in March 2012. Sales in Australia and New Zealand began in April 2012. The Aqua is considered the most successful nameplate launch in Japan in the last 20 years. As of January 2017[update], the Aqua/Prius c is the second most sold hybrid of Toyota Motor Corporation after the regular Prius, with 1,380,100 units sold worldwide. Japan as the market leader with 1,154,500 units sold through January 2017. The Aqua was the top selling new car in Japan for three years in a row, from 2013 to 2015. Prius c concept exhibited at the 2011 Washington Auto Show. The Toyota Prius c concept car was unveiled at the January 2011 North American International Auto Show in Detroit. Toyota explained that the 'c' in 'Prius c' stands for "city"-centric vehicle as it is much smaller than the normal Prius and is aimed at younger buyers without families who don't need lots of space. Together with the introduction of the production version of the Toyota Aqua at the 2011 Tokyo Motor Show, the carmaker also exhibited two other Aqua concepts, the Aqua Kiriri version and the Aqua Piriri. Generation 3 (chainless) Hybrid Synergy Drive. The ICE-MG1 Power Split Device/MG2 Motor Speed Reduction Device HSD is shown in a sectioned and highlighted view. Built on an enhanced and streamlined Yaris-inspired platform, the Prius c features Toyota's Generation 3 Hybrid Synergy Drive with a 1.5-liter DOHC four-cylinder, 16–valve with VVT-i gasoline engine, the same engine model and displacement as on the earliest Priuses, but is now "beltless". The air conditioner is a self-contained unit containing a motor & compressor powered by the 144-volt traction battery, and the 12-volt battery is charged via a DC-DC converter also powered by the traction battery . 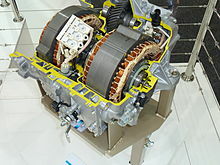 Unlike earlier Prius HSDs, the Prius c incorporates separate planetary gear reduction paths for the ICE/MG1 (internal combustion engine/motor-generator one, this path familiarly referred to as the "power split device", with the MG1 doing double duty as the ICE starter and a battery charging alternator; HV to charge the HV battery, HV through a dc–dc converter to charge the LV battery), and the MG2 (motor-generator two, this path newly referred to as the "motor speed reduction device", with the MG2 doing double duty as the traction (propulsion) motor and the HV battery regenerative charging alternator), thereby allowing higher electric-only performance (this is limited mainly by the MG1-to-final-drive ratio, and, of course, the capacity of the MG1), and higher hybrid performance (this is limited mainly by the MG2-to-final-drive ratio, and, of course, the capacity of the MG2), with the gear ratios, hence the rotational speeds of the MG1 and MG2, now better matched to their respective mission functions, in a significantly smaller, lighter weight package. The chain drive found in the Gen 1 and Gen 2 HSDs is also eliminated, replaced by helical gears in the Gen 3 HSD. The MG2 ratio is 2.5:1 rather than 1:1 as on earlier HSDs, thereby allowing the physical size of the MG2 to be reduced to the cross-section of the MG1. The Prius v and Prius Plug-in share this basic Gen 3 design (P410 transaxle, for both of these), but not its specific implementation, and which is unique to the Prius c and its lower maximum weight, and lower HSD net horsepower (P510 transaxle, for Prius c, North America; Prius Aqua, Japan; and Yaris Hybrid, Europe). The hybrid system includes a new high-voltage battery and inverter, and a smaller auxiliary 12 volt battery. Both batteries are housed underneath the rear passenger bench seat, and are easily accessible to service personnel, yet are protected from possible collision damage by a welded tubular steel cage which also acts as support for the rear seat. Being housed underneath the passenger seat, the large high voltage traction battery does not impact the trunk space, unlike the traction battery on earlier Priuses. This location for the traction battery also significantly lowers the center of gravity of the Prius c, and improves road handling. The hybrid powertrain weighs around 40 kg (88 lb) less than that of the standard Prius Liftback. The 1NZ-FXE engine produces 54 kW (73 hp) and the HSD motor is rated at 45 kW (60 hp). Total output is rated at 74 kW (99 hp). Compared to the standard Prius Liftback, the 2,550 mm (100.4 in) wheelbase of the Prius C is 150 mm (5.9 in) shorter, and an overall length of 4,000 mm (157.3 in) is 490 mm (19.1 in) shorter. This places the Prius c in the American subcompact class. Japanese versions are also compliant with Japanese government dimension regulations which reduce tax liability. The use of a 1.5 litre engine also reduces the annual Japanese Government road tax obligation. Two optional driving modes are offered: "EV Mode enables electric driving for up to one mile. ECO Mode limits the operation of the climate control and adjusts throttle input to help maximize fuel economy". Under the United States Environmental Protection Agency test cycles, the 2017 Prius c is rated at 48 mpg‑US (4.9 L/100 km; 58 mpg‑imp) city and 43 mpg‑US (5.5 L/100 km; 52 mpg‑imp) highway, for a combined fuel economy of 46 mpg‑US (5.1 L/100 km; 55 mpg‑imp). The Prius c emission certification is SULEV. The Prius c was ranked by the EPA as the 2012 model year most fuel efficient compact car excluding plug-in electric vehicles. When electric-powered cars are considered, the Chevrolet Volt ranks on top of the compact car category, followed by the Prius c.
The Prius c is assembled at the Iwate Plant of Toyota Motor East Japan, Inc., a wholly owned subsidiary of Toyota Motor Corporation, in Kanegasaki, Iwate in northern Japan. Toyota's initial production capacity for the Aqua/Prius c at this facility was 12,000 units per month, with a maximum production capacity of 30,000 units per month. The decision to manufacture at Toyota Motor East Japan (formerly Kanto Auto Works) was motivated by the 2011 Tōhoku earthquake and tsunami – Toyota is making a valuable economic contribution to the region in providing jobs and development associated with production. The first facelift of the Prius c was presented at the November 2014 Los Angeles Auto Show. The new model has a revised front bumper and headlights similar to the GT86, with a more aggressive and aerodynamic look. The taillights are also modified, now incorporating black plastic segments towards the leading edge. The interior features metallic HVAC vents, as well as a redesigned climate control cluster. A second facelift of the Toyota Prius c was released in 2017 with minor subtle changes. Changes included; reshaping of bonnet, new bumpers and new wheel arches. However the powertrain is not altered, still utilizing the 1.5 litre four-cylinder engine. During 2012 a total of 315,406 units were sold worldwide, led by Japan with 266,574 Aquas sold, representing 84.5% of the model global sales. The Prius c is not available in Europe, instead, Toyota is selling the Toyota Yaris Hybrid since June 2012. The Yaris Hybrid shares the same powertrain as the Prius c. Global sales of the Aqua/Prius c passed the 500,000 milestone in August 2013, and the 1 million milestone during the first half of 2015. As of January 2017[update], the Aqua/Prius c is the second most sold hybrid of Toyota Motor Corporation after the regular Prius, with 1,380,100 units sold worldwide. The market leader is Japan with 1,154,500 units sold, capturing 83.6% of global sales. Ranking second is the U.S. with 177,218 units sold through December 2016, and Canada with 11,879 through April 2016. A total of 31,000 units have been sold in the rest of the world through April 2016. For three years running, 2013 through 2015, the Aqua was the top selling new car in Japan. The Aqua is considered the most successful nameplate launch in Japan in the last 20 years. The following table presents retail sales since deliveries of the Aqua began in December 2011 for the top selling national markets by year through April 2016. Notes: (1) CYTD sales through April 2016. (2) CYTD sales through June 2013. (3) Australian sales are not included. The Aqua was launched in Japan in December 2011 at a price of ¥1.69 million (US$21,700), and is available at all Japanese Toyota networks Toyota Store, Toyopet Store, Corolla Store and Toyota Netz. Toyota initially established a sales target of 12,000 units per month, but before its market launch, Toyota had received orders for 60,000 Aquas, creating a four-month waiting list for deliveries. By January 31, 2012, the number of orders grew to 120,000. The Aqua was the third top selling new car in the Japanese market in February and March 2012, and ranked second from April through September, surpassed only by the combined sales of the regular Prius and Prius α, as Toyota is reporting sales of both models together. The Aqua ranked as the top selling new car in Japan in October 2012, surpassing combined sales of the regular Prius and the Prius α, which ranked second, and ending the Prius brand record of being the top selling new car in Japan for 16 months in a row. The Aqua kept the top selling spot through December 2012, and with 266,567 units sold in 2012, the Aqua ranked as the second best selling car that year after the Prius brand. When sales of these two Prius models are broken down, the Toyota Aqua ranks as the top selling model in Japan, including kei cars, and the Aqua led monthly sales since February through December 2012. The Aqua continued as the top selling car in Japan during every month of the first quarter of 2013, and after ranking second behind the Toyota Prius during the second quarter, the Aqua was again the top selling car in Japan during the third quarter of 2013. A total of 262,367 Aquas were sold in 2013, down 1.6% from 2012, but nevertheless, the Aqua topped new car sales in Japan in 2013, including kei car sales. With 233,212 units sold during 2014, down 11.1% from 2013, the Aqua was the top selling new car in Japan for the second consecutive year. Again in 2015, with 215,525 units sold, down 7.6% from 2014, the Aqua ranked as the top selling new car in Japan. During the first quarter of 2016, the Prius liftback surpassed the Aqua as the best selling new car, and ended 2016 as the second best-selling new car with 168,208 units sold. Since its introduction, a total of 1,154,500 units have been sold in Japan through January 2017, representing 83.6% of the model global sales. In addition of being the best-selling new car in Japan for three consecutive years, 2013 through 2015, the Toyota Aqua is considered the most successful nameplate launch in the Japanese market of the last 20 years. Sales of the Prius c began in the U.S. in March 2012, at a price starting at US$18,950 plus a US$760 destination charge. After three days in the American market, the carmaker announced that the Prius c became "one of Toyota's fastest-selling vehicles." During its first month in the market, the Prius c sold 4,875 units, accounting for 17.0% of the Prius family sales in the U.S. A total of 35,733 units were sold during 2012, and the Prius c ranked as the fourth best selling hybrid car in the U.S that year. During 2013 a total of 41,979 units were sold, allowing the Prius c to rank as the third top selling hybrid car during that year, behind the Prius liftback and the Camry Hybrid sedan. During the first nine months of 2014 Prius c sales were down by 4.7% as compared with the same period in 2013, following the same declining trend as the overall hybrid segment in the American market. As of December 2016[update], a total of 177,218 units have been sold since its introduction in March 2012. The Prius c is offered in four trims named Prius c One through Prius c Four. The basic level Prius c One includes power windows and door locks, automatic climate control, Multi-Information Display (MID), Hill Start Assist Control (HAC), Remote Keyless Entry, projector-beam halogen headlamps, steering wheel-mounted audio controls, 4-speaker audio, Bluetooth hands-free telephone controls, Bluetooth and USB auxiliary outlets, and rear intermittent window wiper. The Prius c Four, which sells for US$23,230 also includes Softex-trimmed seats, heated front power mirrors with turn signal indicators, alloy wheels, and fog lamps. For the 2015 model year, the Prius c received a light facelift with alterations to the front and rear lamps and bumpers. Three new bright colors have also been added to the North American lineup. Toyota Canada launched the Prius c in March 2012 with a starting price of CA$20,950 (US$21,100). During its first month in the Canadian market, 328 units were sold and the Prius c represented about 25% of Toyota subcompact sales that month. A total of 556 units were sold in April, its first full month in the market, accounting for 39% of total Prius family sales and 33% of Toyota subcompact sales. A total of 2,530 units were sold during 2012, 2,816 units in 2013, and sales declined to 2,776 in 2014, and recovered to 3,029 in 2015. Since its introduction, a total of 11,876 Prius c hybrids have been sold through April 2016. The Prius c was released in Australia in April 2012 starting at A$23,990 (US$24,426). A second trim with the higher-spec model is called Prius C i-Tech and priced at A$26,990 (US$27,480). A total of 1,883 units were sold during 2012, significantly ahead of Prius v (936 units) and the conventional Prius (861 units). Sales during the first half of 2013 reached 1,242 units, again surpassing Prius v (539 units) and the Prius liftback (277 units). Again in 2014, sales of the Prius c (1,654) topped its siblings Prius v (722) and the third-generation Prius hatch (487). As of April 2016[update], cumulative sales since introduction totaled 7,432 units. Excluding the Japanese and North American markets, a total of 25,462 units have been sold in other countries as of September 2014[update]. The Prius c was introduced in 2012 at a price starting at US$36,000. As the other electric-drive vehicles sold in the country, the Prius c is subject to lower import duties and local taxes. Since October 2012, Prius c owners are exempted from the driving restriction by license plate number used to control access to downtown San José, the country's capital. Toyota launched the Prius c in Ecuador in April 2012, with the standard price of US$26,900. A total of 358 Prius c were sold during 2012, surpassing combined sales of the conventional Prius (132 units) and the Prius v (113). The Prius c was launched in Malaysia in February 2012, where it costs RM97,000 (US$31,750) including insurance. Sales of the Prius c in New Zealand began in April 2012, starting at a price of NZ$30,990 (US$25,400). Toyota launched the Prius c in the Philippines in January 2012, with the introductory pricing of ₱1,475,000 (US$34,250). The Prius c was launched in Singapore in January 2012, costing about S$115,988 (~US$93,257) for the base trim and about S$118,988 (~US$95,670) for the Snazzy trim with a COE of S$64,209 (~US$51,625) as of March 2013. Toyota launched the Prius c in Taiwan in March 2012, starting at a price of NT$859,000 (US$29,100). The Prius c was one of the five finalists for the 2013 Green Car of the Year awarded by the Green Car Journal at the 2012 Los Angeles Auto Show. In November 2012, Consumer Reports ranked the Prius c as the most reliable 2012 model year vehicle in the United States. The magazine based this later ranking on reliability data obtained through its annual auto survey that covers 1.2 million vehicles owned or leased by subscribers to Consumer Reports. In 2018, they recognized Toyota as the second most reliable automobile manufacturer, and the Prius C as the most reliable vehicle offered by the company. The magazine had previously given a negative review for the Prius c. The magazine had based this earlier ranking on driving tests by its own testers. ^ a b "Affiliates (Toyota wholly-owned subsidiaries)-Toyota Motor East Japan, Inc". Toyota. 2012. Retrieved 2014-07-15. ^ a b c d e f g Toyota (2011-11-15). "Toyota Prius c Provides a Subcompact Entry Point to Prius Family of Hybrid Vehicles". Toyota USA Newsroom. Retrieved 2011-11-15. ^ Josh Pihl (January 2014). "Table 33. Batteries for Selected Hybrid-Electric Vehicles, Model Years 2013–2014". Oak Ridge National Laboratory. Archived from the original on 2014-11-29. Retrieved 2014-11-21. ^ a b "Toyota Reveals Prius Family of Vehicles at the North American International Auto Show". Press release Toyota USA Newsroom. 2011-01-10. Retrieved 2011-11-15. ^ "Toyota introduces Prius c, reveals NS4 advanced plug-in hybrid concept targeted for 2015". Green Car Congress. 2012-01-10. Retrieved 2012-01-10. ^ a b c Hans Greimel (2011-11-14). "Toyota to debut sporty coupe, Prius C and more at Tokyo show". AutoWeek. Retrieved 2011-11-15. ^ a b US DoE and US EPA (2012-02-10). "2012 Most and Least Efficient Vehicles". Fueleconomy.gov. Retrieved 2012-02-11. When PEVs are included, the Chevrolet Volt is the 2012 most fuel efficient compact car. ^ a b c d Sebastian Blanco (2012-02-08). "Toyota prices 2012 Prius C under $19K*". Autoblog Green. Retrieved 2012-02-11. ^ Toyota Press Release (2011-11-15). "Prius C revealed among Toyota lineup for Tokyo Motor Show". AutoblogGreen. Retrieved 2011-11-15. See Toyota Press Release for details. ^ a b Anna Mukai and Yuki Hagiwara (2011-12-25). "Toyota Adds to Prius Lineup With Smallest Hybrid". Bloomberg. Retrieved 2011-12-26. ^ a b "Toyota Philippines launches all-new Prius C – Top Gear Philippines". ^ a b "New Toyota Prius c officially launched – RM97,000 OTR! – Paul Tan". ^ a b Donny Nordlicht (2012-03-12). "Make It Yours: 2012 Toyota Prius c Configurator Goes Live". Motor Trend. Retrieved 2012-03-12. ^ a b c "Prius c hybrid goes on sale in US with entry MSRP of $18,950; new transaxle, motor technology". Green Car Congress. 2012-02-08. Retrieved 2012-02-11. ^ a b Mike Stevens (2012-03-27). "Toyota Prius C On Sale In Australia". The Motor Report. Retrieved 2012-05-22. ^ a b Alastair Sloane (2012-03-17). "Toyota on hybrid recruitment drive with baby Prius". The New Zealand Herald. Retrieved 2012-03-17. ^ a b c Mat Gasnier (2013-01-12). "Japan Full Year 2012: All-new Toyota Aqua tickles Prius". Best Selling Cars Blog. Retrieved 2013-03-30. ^ a b c "Worldwide Sales of Toyota Hybrids Surpass 10 Million Units" (Press release). Toyota City, Japan: Toyota. 2017-01-14. Retrieved 2017-01-15. This latest milestone of 10 million units was achieved just nine months after total sales reached 9 million units at the end of April 2016. The Prius family accounts for 61% of Toyota's total global cumulative hybrid car sales: 6.115 million units, consisting of Prius liftback: 3.9846 million; Aqua, Prius c: 1.3801 million; Prius α, Prius v, Prius +: 614,700; and Prius PHV: 79,300. ^ a b c Henk Bekker (2015-01-08). "2014 (Full Year) Japan: Best-Selling Car Models". Best Selling Cars. Retrieved 2015-01-23. ^ a b c Bekker, Henk (2016-01-08). "2015 (Full Year) Japan: : 30 Best-Selling Car Models". Best Selling Cars. Retrieved 2016-05-24. ^ a b c d Gasnier, Mat (2017-01-17). "Japan Full Year 2016: Toyota Prius returns to #1 spot after 3 year-hiatus". Best Selling Cars Blog. Retrieved 2017-02-26. ^ "Toyota Aqua concepts hint to a Prius C of possibilities". Autoblog Green. 2011-12-01. Retrieved 2011-12-04. ^ Prius C Hybrid Vehicle Dismantling Manual (NHP10 Series). Toyota. 2011. pp. 6, 7, 9. ^ Spinks, Jez (2012-03-27). "Toyota Prius C Review". Australia: CarAdvice. Retrieved 2018-12-30. ^ "Aqua specs" (in Japanese). Japan: Toyota. Retrieved 2012-01-20. ^ "2012 Detroit Auto Show: 2013 Toyota Prius C priced below $19,000". US: Autospies. 2012-01-11. Retrieved 2012-01-11. ^ "MY19 Prius c eBrochure" (PDF). US: Toyota. Retrieved 2018-12-30. ^ "2017 Toyota Prius c". www.fueleconomy.com. US Department of Energy and US Environmental Protection Agency. 2017-08-18. Retrieved 2017-08-18. ^ a b Bertel Schmitt (2012-02-01). "Toyota Drowns In Orders For Game Changing Prius C". HybridCars.com. Archived from the original on 2012-02-06. Retrieved 2012-02-11. ^ a b "2014 Los Angeles: 2015 Toyota Prius C Facelift". car24news.com. 2014-11-27. Retrieved 2015-03-28. ^ Fink, Greg (25 July 2017). "Toyota Prius C Adopts a Neo-SUV Look for 2018". Retrieved 6 June 2018. ^ a b Toyota Global Newsroom (2014-10-14). 実績データ（ハイブリッド車グローバル販売） [Actual data (hybrid vehicles sold globally)] (in Japanese). Toyota. Retrieved 2014-10-25. A total of 7,053,000 hybrids have been sold worldwide by TMC through September 2014 (includes Prius PHV). ^ Laurent J. Masson (2012-01-16). "The Toyota Yaris hybrid, one for Europe". Motor Nature. Retrieved 2012-02-11. ^ a b c 新車乗用車販売台数ランキング [New passenger car sales ranking] (in Japanese). Japan Automobile Manufacturers Association. Retrieved 2013-01-16. Select Year 2012 and see total sales from January to December. Toyota is reporting in Japan sales of the regular Prius and Prius α together. ^ a b 新車乗用車販売台数ランキング [New passenger car sales ranking] (in Japanese). Japan Automobile Manufacturers Association. Retrieved 2014-01-10. Select Year 2013 and see total sales from January to December. Toyota is reporting in Japan sales of the regular Prius and Prius α together. ^ a b c d e Jeff Cobb (2013-01-08). "December 2012 Dashboard". HybridCars.com and Baum & Associates. Retrieved 2013-01-17. Refer to section – December 2012 Hybrid Cars Numbers. ^ Jeff Cobb (2013-08-05). "August 2013 Dashboard". HybridCars.com and Baum & Associates. Retrieved 2013-08-05. Refer to section – U.S. Hybrid sales for August 2013: A total of 29,850 units had been sold between January and August 2013. ^ "Hybrid Model Global Sales Results" (Press release). Toyota City, Japan: Toyota. 2015-08-21. Retrieved 2015-08-23. ^ a b c d Jeff Cobb (2014-01-03). "US Plug-in Vehicle Sales Surge in 2013". HybridCars.com. Retrieved 2014-01-10. ^ a b c Jeff Cobb (2015-01-06). "December 2014 Dashboard". HybridCars.com and Baum & Associates. Retrieved 2015-01-23. ^ a b c Cobb, Jeff (2016-01-06). "December 2015 Dashboard". HybridCars and Baum & Associates. Retrieved 2016-05-23. ^ a b Cobb, Jeff (2017-01-05). "December 2016 Dashboard". HybridCars.com and Baum & Associates. Retrieved 2017-02-28. ^ a b c d e "Toyota Prius C Sales Figures: US & Canada". Good Car Bad Car. May 2016. Retrieved 2016-05-24. ^ a b c "Worldwide Sales of Toyota Hybrids Surpass 9 Million Units" (Press release). Toyota City, Japan: Toyota. 2016-05-20. Retrieved 2016-05-22. ^ a b KYODO (2014-01-09). "Nissan set to double Leaf sales: Ghosn". The Japan Times. Retrieved 2014-01-25. ^ a b "実績データ（ハイブリッド車グローバル販売）" [Actual data (global sales hybrid vehicles)] (Press release) (in Japanese). Toyota City, Japan: Toyota. 2016-05-20. Retrieved 2016-05-24. ^ Cobb, Jeff (2016-05-04). "April 2016 Dashboard". HybridCars.com and Baum & Associates. Retrieved 2016-05-24. ^ a b "Record Hybrid Sales For Toyota, Industry" (Press release). Toyota Motor Corporation Australia. 2013-01-24. Retrieved 2013-09-07. ^ a b Mat Gasnier (2013-07-29). "Australia 6 months 2013: Discover the Top 292 All-models ranking!". Best Selling Cars Blog. Retrieved 2013-09-07. ^ a b Marton Pettendy (2015-02-11). "Cut-price Prius c the first of 10 new Toyotas in a year". Motoring.com.au. Retrieved 2015-08-23. Toyota Australia sold 1,654 Prius c, 722 Prius v and 487 third-generation Prius hatches in 2014. ^ a b "Toyota Sells 9 Millionth Hybrid car". Electric Vehicle News. 2016-05-19. Retrieved 2016-05-24. ^ Yoshio Takahashi (2011-12-26). "Toyota Rolls Out 'Prius c' in Japan Ahead of U.S. Debut". The Wall Street Journal. Retrieved 2012-02-11. ^ Nikkei (2012-06-08). "Hybrids 19.7% of New Cars Sold in May 2012 in Japan". Integrity Exports. Retrieved 2012-06-10. ^ Associated Press (2012-10-06). "Aqua Tops Prius as Best-Selling Car in Japan". Product Design and Development (PDDnet). Retrieved 2012-11-10. ^ Mat Gasnier (2012-11-06). "Japan October 2012: Toyota Aqua takes the lead, 86 up to #14". Best Selling Cars Blog. Retrieved 2013-09-07. ^ "Japan by version December 2012: Nissan Sylphy & Subaru BRZ up". Best Selling Cars Blog. 2013-09-29. Retrieved 2013-03-30. ^ "2013 (Q1) Japan: Best-Selling Vehicle Producers and Car Models". Best-selling-cars.com. 2013-04-09. Retrieved 2013-04-18. ^ Mat Gasnier (2013-09-05). "Japan August 2013: Toyota Aqua #1, Honda Freed back up to #7". Best Selling Cars Blog. Retrieved 2013-09-07. ^ Bekker, Henk (2016-04-06). "2016 (Q1) Japan: Best-Selling Car Brands and Models". Best Selling Cars. Retrieved 2016-05-24. ^ Bekker, Henk (2017-01-11). "2016 (Full Year) Japan: 30 Best-Selling Car Models". Best-Selling Cars. Retrieved 2017-02-23. ^ Sebastian Blanco (2012-03-16). "Toyota Prius C outsells monthly totals of Chevy Volt, Nissan Leaf in three days". Autoblog Green. Retrieved 2012-03-17. ^ Jeff Cobb (2014-10-14). "September 2014 Dashboard". HybridCars.com and Baum & Associates. Retrieved 2014-10-03. See section: "September 2014 Hybrid Car Sales Numbers"
^ Toyota Canada (2012-01-12). "Toyota Prius c Completes the Prius Family of Vehicles". Toyota Canada Newsroom. Retrieved 2012-02-11. ^ Toyota Canada. "2012 Prius c". Toyota Canada. Retrieved 2012-03-17. ^ Toyota Canada (2012-04-03). "New models and hybrids power Toyota Canada Inc.'s sales in March 2012". Toyota Canada Newsroom. Retrieved 2012-05-01. ^ Toyota Canada (2012-05-01). "Canadians spring into Toyota hybrids to power April 2012 sales". Toyota Canada Newsroom. Retrieved 2012-05-01. ^ Camila Salazar (2013-07-06). "Carros híbridos y eléctricos se abren paso en Costa Rica" [Hybrid and electric cars make their way into Costa Rica]. La Nación (in Spanish). Retrieved 2013-09-07. ^ Mat Gasnier (2013-01-20). "Hong Kong (China) Full Year 2012: Mercedes E-Class most popular,BMW 5 Series on podium". Best Selling Car Blog. Retrieved 2013-01-22. ^ Ee, Samuel (2012-02-24). "Toyota Prius gets more affordable with the C". Asia One – Motoring. Retrieved 2012-02-24. ^ "車壇大事紀－和泰引進 TOYOTA Prius c 36.69 km/L 市區油耗世界第一" [Car Altar Events – and the Thai introduction of the TOYOTA Prius c, the world's first with an urban fuel consumption of 36.69 km /L]. China Times (in Chinese). 2012-04-02. Retrieved 2012-04-02. ^ Barcia, Rodrigo (2012-04-30). "Lanzamiento: Toyota Prius c" [Launching: Toyota Prius c]. Autoblog (in Spanish). Uruguay. Retrieved 2018-04-06. ^ Barcia, Rodrigo (2018-03-19). "Lanzamiento: Toyota Prius c (facelift)" [Launching: Toyota Prius c (facelift)]. Autoblog (in Spanish). Uruguay. Retrieved 2018-04-06. ^ Sebastian Blanco (2012-11-29). "Ford Fusion wins 2013 Green Car Of The Year". Autoblog.com. Retrieved 2012-11-29. ^ Danny King (2012-11-01). "Consumer Reports says Prius C most reliable 2012 vehicle". Autoblog Green. Retrieved 2012-11-02. ^ "The 15 most reliable car brands of 2018". Business Insider. Retrieved 2018-11-19. ^ Scott Burgess (2012-05-29). "2013 Toyota Prius C doesn't get much love fromConsumer Reports". Autoblog.com. Retrieved 2012-11-02. Wikimedia Commons has media related to Toyota Prius c, Toyota Aqua and Toyota Prius C concept. (C+US) Vehicles exclusive to Canada and U.S.
(US) Vehicles exclusive to U.S. This page was last edited on 26 March 2019, at 04:33 (UTC).